← Flyleaf — Christian Rock? 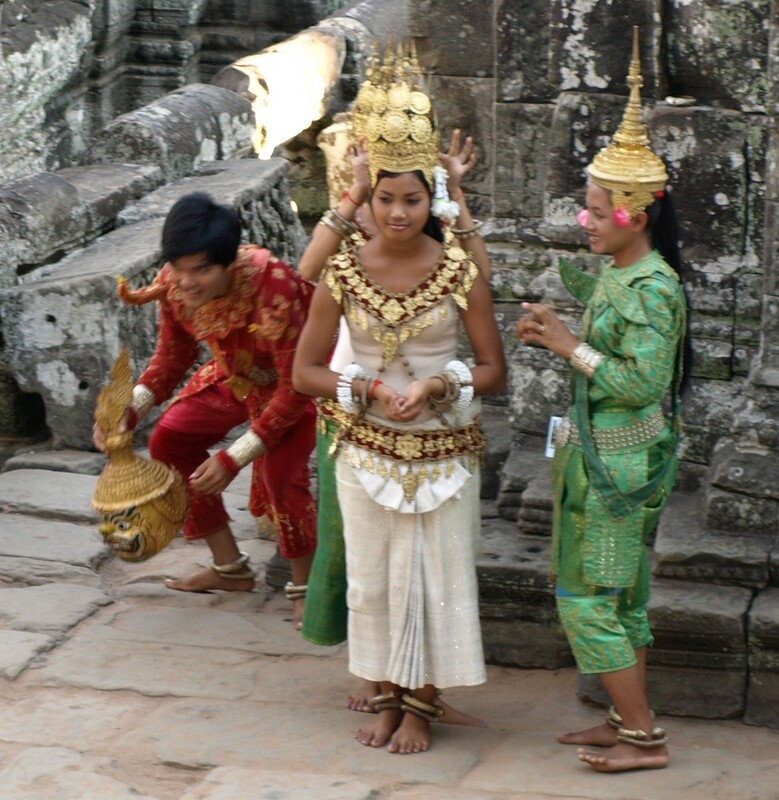 When I returned to Siem Reap last month, I had my High Def Digicam with me. So I went back to the Temple Club and recorded their Apsara Dance show with it. Much clearer. The only problem I had this time was two drunk Russians behind me who were talking loudly and oft times over the music. The recording didn’t turn out as badly as I thought it would. You can’t hear them nearly as much as I had to during the show. I even got frustrated once or twice and started mocking them and turned around and glared at them. But they never got the hint. I don’t think Becca or the Temple Club were in the mood for a knife fight between two drunk Russkies and me, so I refrained from telling them to shut the hell up. I don’t think they spoke English anyway. They did seem to enjoy the show, though. And I got a good laugh out of it later as you will see in the video below. 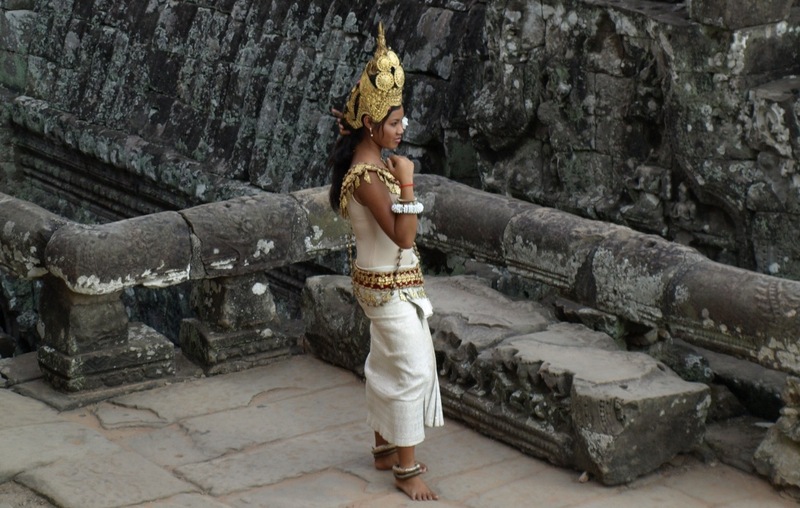 I always love the Apsara. The girl in the middle here. The lead dancer. She’s been doing this for quite a while. And she’s picture perfect at it. 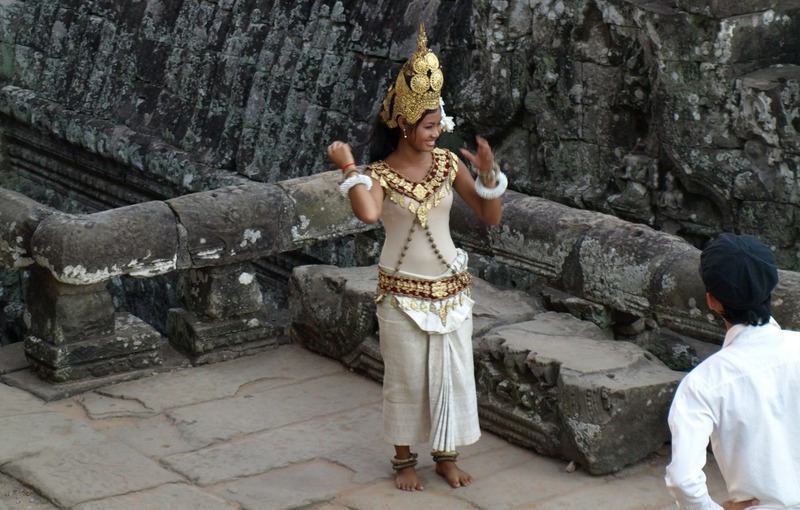 I could see her dancing for Jayavarman VII at Bayon or Indravarman II at Bakong. 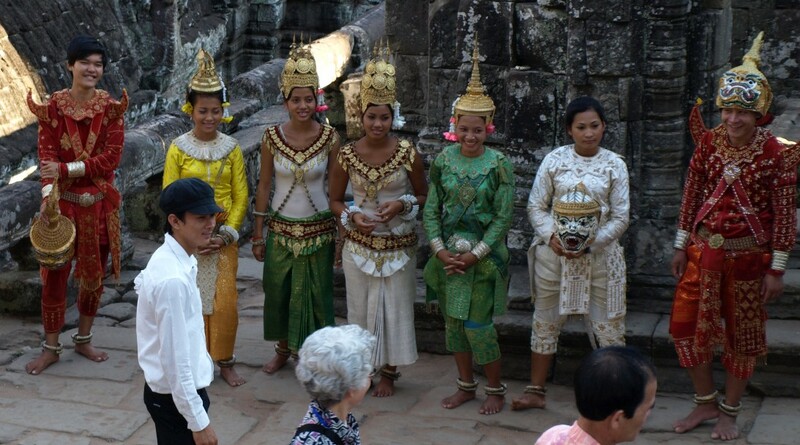 I’d love to get one of these girls to pose at the actual temples one day and snap some photos. The girls who pose for pictures at the actual Temples these days look a bit cartoon-ish. I don’t know if that’s by design or if their managers just don’t know any better. The other girls in the video are new. If you watch closely, you can see them smile or snicker a bit when they screw up. It was cute and made the show a little more “fun” than usual. Near the end, Becca and I sat there and laughed with them which I think made them laugh a little more. I think this dance is called Robam Phuong Neari– a dance concerning the beauty of flowers and maidens. The short dances which are actually excerpts from longer story lines are called “robam.” The longer story lines from which these robam are drawn are called Lkhaon. T he video below is right after the show. I’m a little peevish about the loud Russians during the show. But decide to laugh it off. It’s got a bit of profanity in it (that terrible “F” word of which I’m so find. lol). So be careful if you are offended by that. It also shows the Temple Club under the restaurant. Pool tables. Bar Girls. Tourists. Loud music. Flashing lights. You’ll notice that the club is open air. No doors. Just a great foyer through which you step to get out of the rain should the weather turn on you. Most of the bars and restaurants on Pub Street in Siem Reap follow this design. The pictures above were taken at Bayon. 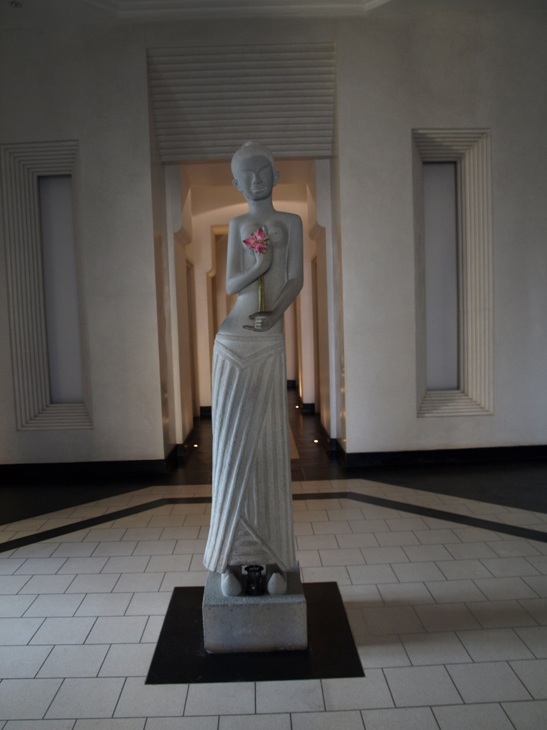 Except for the last which is the statue at the entrance to the hotel in which I stayed while at Siem Reap this visit. The Hotel De La Plaix. It is an excellent place to stay while in Siem Reap. The rooms are like mini-spas. The bathtubs are huge and are filled with a water fall. Seperate showers with showerheads that rain water down on you. The water gradually heats. Huge, comfortable beds that they turn down for you each night. The whole place smelled of jasmine as they burn jasmine oil in the hallways day and night. Plus they provide an Ipod and speaker system for each room so you can listen to music as if you were back home. The staff were all friendly and helpful. Courteous and professional. And the girls at the front desk were all cute. lol Beautiful place to stay. Beautiful Aspara performance. See there? I know what that is now…lol Thanks. The hotel sounds amazing. Would really like to go there someday. The hotel was great. And it wasn’t too far from all of the action either. A 2 or 3 minute walk and you were a part of the big party. lol Good stuff. I enjoyed my stay. TO THE NEXT EPISODE! GLAD YOU AND BECCA HAD SUCH A GREAT TIME. Very good entertainment. Wish I could go there. Jamaal. Thanks for stopping by brother. I always enjoy Asia. I’m back in Herat now. now apsara is a new version from the old one.The crown quiet different.